The history of the Babenhausen Kaserne actually goes back to the year 1891. At that time Babenhausen had hosted three squadrons of the Red Dragoons, this unit had its home in the Babenhausen castle from 1869 until the unit left in 1891. At that time German communities “applied” for garrison rights, naturally the "applicant" had to invest in building an adequate military infrastructure, in return the garrison communities grew to prosper with soldiers investing into the town shops and guest houses this also created jobs. With the Dragoons leaving in 1891, Babenhausen was no more a garrison town, thus leaving a gross financial loss for the community. With Babenhausen no longer a garrison town, the city council started long diplomatic efforts to host a military garrison again, finally in early 1899 the efforts began to materialize. In pre-contract negotiations the German Reichstag and War department accepted the city councils offer to build a Kaserne at a cost of about 500.000 Reichmark, in return the War department agreed to send three Field Artillery battery's to Babenhausen. After further contract negotiations, Babenhausen finally agreed to build a Kaserne at an estimated price of 1 Million Reichsmark and the German Reich had the option to acquire the Kaserne after 25 years. In early 1900, the city council bought the necessary 10 acres and began to assign construction company's. 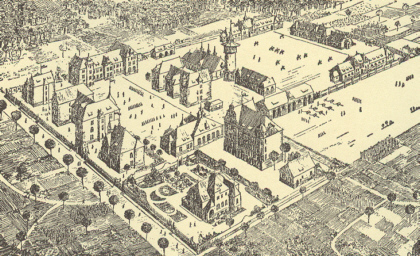 The official groundbreaking ceremony for the Babenhausen Kaserne took place on July 3rd 1900. With construction going faster than estimated, and with a mild winter, the construction of 21 buildings and the water tower was completed by October 1 1901, and the 2nd battalion of the 61st Field Artillery Regiment of the Grand Duke of Hessen was the first unit to be stationed in the Kaserne. In the following 13 years the people of Babenhausen and the soldiers of the 2/61Field Artillery grew together, and "our soldiers” were very much part of the community. All this ended on August 1 1914,.... it was a Saturday at about 6 p.m., as the German mobilization order was announced to the public World War I had begun. On August 1 Germany, an ally of Austria-Hungary, declares war on Russia and demands the neutrality of Russia's ally France; France refuses and mobilizes. On August 3 Germany declares war on France. Britain responds by declaring war on Germany. In Babenhausen, the 2/61 Field Artillery received orders and left for France on August 7 1914. During World War I the Kaserne was used mainly as a hospital and a veterinary hospital. As WWI came to an end on November 11 1918, the 2/61st Field Artillery returned to Babenhausen in December, and was deactivated. The Kaserne hospitals were deactivated on April 1 1919. leaving the Kaserne vacant. The Kaserne was then occupied by a French infantry battalion from April 8th to May 17th 1920. Shortly after the French left Babenhausen, the II battalion 35th Reichswehr regiment moved in to the Kaserne, only having to leave Babenhausen in compliance to the treaty of Versailles on September 30 1920. The Kaserne was then occupied by 250 non military personal of the 3rd detachment of the Hessian security police on October 1st 1920. In March 1923 the Hessian Police school moved from nearby Darmstadt to Babenhausen. After reassignments of the police units to Offenbach and Darmstadt, the Kaserne was vacant again in September 1929. Again Babenhausen was searching for Kaserne tenants. A small part of the Kaserne was occupied by the University of Darmstadt in 1930-31, also a small group of flyer's from Darmstadt, used the parade ground as a runway for their gliders. On July 20 1933 the Kaserne was occupied by the “SA Bde 50, Hessen-Darmstadt”, thus implementing a “SA Sports school” until April 1st 1935, when all “SA Sports schools” were disbanded”, and the Kaserne was empty again. The German 36th Field Artillery regiment was stationed in Babenhausen from November 8th 1936 to June 14th 1938, when they were reassigned to Kaiserslautern. From September 1938 on, the Kaserne was used by “Wehrkreis Reit – Fahrschule XII” , a horse riding and driving school for the German cavalry, this unit leaving Babenhausen for Danzig on 14 November after Germanys raid of Poland September 1 1939, starting WWII. The Kaserne was still used the cavalry school during WWII. The German Luftwaffe stationed two practice airplanes in Babenhausen from 1942 on. In October 1943, the Kaserne was home to a development detachment of the German air force (Luftwaffe), where as in late 1944 the Luftwaffe also stationed several fighter units at the Babenhausen airfield. At the end of WWII the Kaserne had a maintenance company, a AA “Flak” detachment, small groups of disorganized Wehrmacht units and a “SS group of 6 officers including 28 NCO’s. The Kaserne was also used as a POW camp for 400 soldiers from March 16th 1945, until the United States Army’s 3rd infantry Division liberated Babenhausen on March 25th 1945. The US ARMY occupation force did not occupy the Kaserne, the Soldiers confiscated the German houses. Shortly there after the Kaserne was used as an DP (displaced persons) camp and from July 11 the Kaserne was used as a POW camp detaining over 30.000 German POW's, officially the Kaserne was named: PWTE-A-20, the commanding officer was Major William F. Patton. The POW camp was disbanded in October 1946. On May 29 1947 the Kaserne was officially requisitioned by the US ARMY for the United Nations “United Nations Relief and Rehabilitation Administration” (UNRRA) program, a refugee camp for Russians and Poles, and later used as an IRO camp to shelter displaced Lithuanians, Estonians and Latvians for the Refugee program of the United Nations in 1949 – 1950. Starting February 1951 construction in the Kaserne began once more. This time the Kaserne was designated as a semi-permanent US military post. By March 8 two deep water wells were drilled, and “Tent city” was erected to temporarily house the in coming soldiers. The “new” water tower was constructed, as well the first buildings in the newly formed housing area, that rose to 100 apartments in June 1951. On August 7 the 36th Field Artillery Group moved in with the first 500 troops, shortly there after 1400 troops would follow. A fire department was stationed on post in October 1951. The troops favorite dance bar “Picadilly” opened in downtown Babenhausen late 1951, Babenhausen again prospers with soldiers investing into the town shops and guest-houses also jobs are created in and around the Kaserne. 1951, the German flying club LSC is formed, and began to use the airfield with their gliders. Babenhausen Kaserne units in 1953 were; the 36th FA GP; 18th; 519th and 593rd´ Field Artillery Battalions, on 31 January 1953, Babenhausen has 4224 German inhabitants, and 4000 soldiers and family members. By 1960 the first construction phase had ended with the completion of 10 family housing buildings, 6 field grad quarters, an elementary school, tennis courts, a baseball field, an airfield / hangars, a gymnasium, a bowling ally, several motor pools, (all together over 30 buildings were built). 1967, the German government, buys the Kaserne from the city of Babenhausen. March 15 1972 the 36th Field Artillery Group deactivates, and the 41st Field Artillery Group is activated in Babenhausen. June 16th 1982, the 41st Field Artillery Group becomes the 41st Field Artillery Brigade. Construction resumes in the 1980’s, a new dining facility and modern two bedroom barracks are constructed, more housing is built in the housing area also the US ARMY renovates the “old” water tower and later on the Kaserne walls. March 1990, Darmstadt and the sub community of Babenhausen receive the honor “Army Community of Excellence”. Babenhausen based units: HHB 41Bde, 1/27 FA, 4/77 FA, 77 Maintenance Co, 72nd Ord Bn, support Operation Desert Storm August 1990 – May 1991. September 11 2001, for the first time in 100 years the Kaserne was closed, from 3.40 p.m. until 8 p.m. the gates were locked up, this leading to a massive traffic congestion outside of the Kaserne. 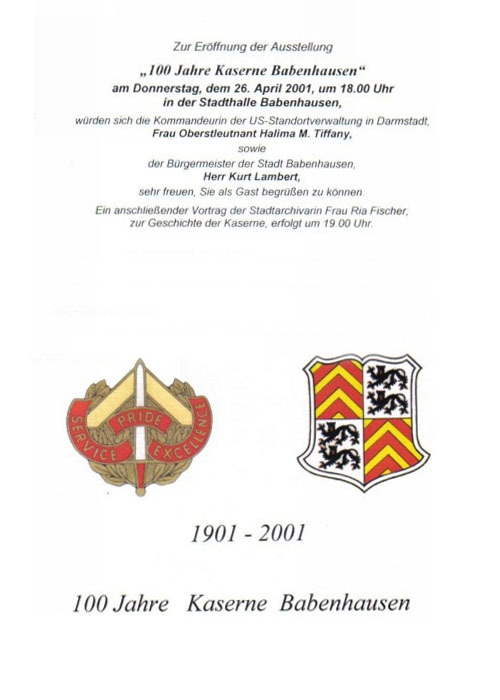 October 1 2001, the Kaserne's 100th Birthday with several festivities. 2003, 1/27 FA, 77 Maintenance Co support OIF. 2005, the first deactivations begin ( July 15, 41st FA Bde). 25 April 2006, 1Bde 27 FA deactivates. 4 August 2006 77 Maintenance Co deactivates. It was around 11a.m. on Friday 29 June 2007, when US Officials signed the papers that officially returned the Babenhausen Kaserne to the German government. With the July 9 2007 closing ceremony, ends the 56 years of US American and 106 years of military presence in the Babenhausen Kaserne.